See that red and gold sticker in the right corner of this book? That’s the James Beard Foundation Cookbook of the Year Award. The black and gold sticker? That would be the IACP Cookbook of the Year Award. 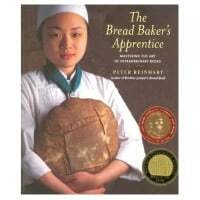 Clearly I’m not the first one to rank “The Bread Baker’s Apprentice” by Peter Reinhart very highly. Even though it came out 8 years ago, it is still one of the best baking books I’ve seen and so I thought I would introduce you to it in case you don’t already own it. What is it About Bread? The first few pages of this book really appealed to the philosopher in me. Most breads have only four ingredients and yet we, as humans, have been trying to perfect the combination of those four ingredients for over 6,000 years. When you think about the history of a baguette, it is pretty astounding. Peter Reinhart does as good a job as any of getting people excited about a simple loaf of bread. He teaches bread baking at Johnson & Wales University, in Rhode Island, the largest culinary school in the world. After reading this chapter, I would want nothing more than to sit down and share a baguette with Peter. Every paragraph in this chapter seethes with passion. It becomes clear in this chapter that the goal of this book is to bring the reader into a new world and, hopefully, transfer some knowledge of that world to the reader. At the end of this chapter he writes some humble, and inspiring, words. The 12 Steps. Chef Reinhart does a fantastic job in the next chapter breaking down all bread making into 12 steps. I’m not going to detail all the steps in this post, but they are very helpful. Once you read it, it becomes obvious how they apply to even seemingly simple baking recipes like No Knead Bread. As someone who has never had formal baking training, I found this to be a very interesting read. An example: Why do you punch down dough? I didn’t really know before I read this chapter. I mean, I knew that certain recipes called for it, and it was fun, but I never really had an idea why you do it. Well, punching down the dough is step 4 and after reading it, I fully understand why you do it (or why you wouldn’t want to do it for some recipes). I honestly feel like my bread baking knowledge increased by about 3-fold just by reading this one chapter. That is not only a reflection on how little I knew about bread, but also a reflection on the wealth of information in this chapter. Baker’s Math. Throughout the entire book, Peter tries to get you thinking like a baker. One of the ways he does this is to introduce the concept of baker’s math. This kind of blew my mind a bit. Basically, he presents all the recipes in the book not as recipes but as ratios. Real bakers don’t think of a baguette recipe as cups, tablespoons, and teaspoons. They think of it as the ratio of flour-water-yeast-salt. So for example, 100-60-2-2. If you have 100 ounces of flour, you will want 60 ounces of water, and 2 ounces of yeast and salt. That’s just an example. This is obviously important to make the recipes very scalable, but there is another even more important reason to start thinking like this. It then becomes easier to tell the difference between recipes. If I just list ounces and tablespoons, it may be hard to notice the difference between two different French Bread recipes if they are written in different quantities. Once you figure out the ratios though, and know something about what the ratios traditionally are, you can begin to see the subtleties of bread. It’s also a heck of a lot easier to remember. The Bread. Needless to say, the recipes in this book are outstanding. They are very clear and easy to follow. Each recipe includes the percentage formula and also a recipe for a normal amount of that bread. There are fantastic photos and excellent descriptions. You can tell that not only has each recipe been meticulously perfected, but also that it was written by a teacher – and a good one. I read a lot of food blogs, and this is probably one of the more frequently sited books for recipe inspiration. I know understand why. I understand exactly why it won all the awards it did. Beginner? This book might be intimidating for a complete beginner to baking. That’s not to say that it wouldn’t be the perfect place to start, as you will learn a lot in the first few pages, but you may be slightly frustrated by the techniques. Shockingly, baking bread is harder than it looks. And while the photos in the book make it look easy to perfectly shape a 24 inch baguette, I assure you that it is not. I would recommend this book to anyone who is serious about wanting to bake real bread and really good bread, but also to anyone who is curious about why you do certain things. If you are a complete beginner, that is okay. Work slowly, read over every recipe a few times before you give it a shot, and give yourself some leeway. Your first (or 1,000th) loaf may not be an award winning loaf, but I promise that it will be rewarding, fun, and most likely, delicious. Good review, although I’ve been moving more towards Hammelman lately over PR. I have just encountered too many recipes from BBA that produce mixed results. So far, I’ve only had success from Hammelman’s Bread book. Thanks for the review/synopsis.